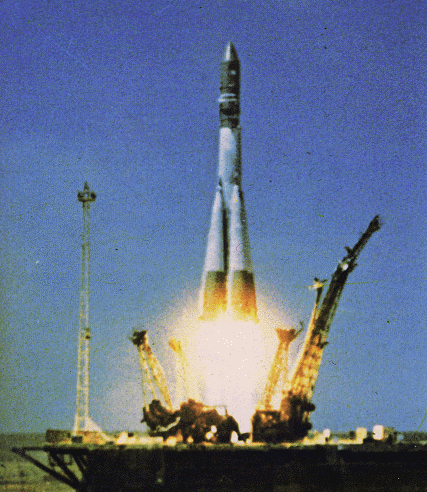 The space capsule has been around for almost 50 years, when Yuri Gagarin headed to space in 1961. There have been many programs that used capsules by both the Americans and the Russians, and even the Chinese are using them now for their spaceflight program. Let’s take a look at this rugged, dependable space vehicle that going to making a comeback in the next decade, when NASA sends humans back to the Moon. Fraser Cane: Space capsules have been around for almost 50 years when Yuri Gagarin headed to Space in 1961. There have been many programs that have used capsules by both the Americans and the Russians and even the Chinese are using them now for their manned spaceflight program. Let’s take a look at this rugged dependable space vehicle that’s going to make a comeback in the next decade when NASA sends humans back to the moon. Alright Pamela – the space capsule – so what are we talking [Laughter] about here when we’re talking about a capsule? Dr. Pamela Gay: The basic idea is you need a rocket to get into Space and you need to put a cone on the top of the rocket to make it more aerodynamic so why not stick a human in that cone? Fraser: I think of a bunch of reasons why not to stick a human in that cone. Pamela: Well yeah, there’s the whole do you really want to have that much rocket fuel strapped to your, you know where I’m going. Fraser: Yeah, to Space and all that kind of stuff. But the shape I guess is a spot where you could put a person. Pamela: It’s the final part that’s left going all the way up into Space because as the rocket launches, as it sheds segment after segment in multi-stage rockets, it’s that nose that finally makes it with the last segment all the way up into orbit. So stick a person there, why not? Fraser: But, I think that when you look at the space capsule as one method of transportation and you compare that to the shuttle, there are two different theories going, right? Pamela: There are two entirely different ideas. In general capsules aren’t reusable. We have actually reused one of the capsules but we didn’t stick people in it the second time it was used. In general the idea behind capsule flight is it is disposable. Everything goes up, the part containing the people comes back down but other than that, you throw out everything as you go. With the space shuttle, other than the external tank, everything gets reused. In theory that should, you’d think, cut down on the price. Now the reality is that the space shuttle is extraordinarily expensive. So much has to go into fitting it, getting it ready to go a second time, refueling it, checking all the electronics, replacing an electronic piece (which sometimes requires eBay nowadays) that it really never was a cost saver. But we thought maybe, but no. Then there’s also the well with capsules you’re kind of dumping people in large segments of the planet Earth. Either some large air of circle on the ocean, some large air of circle on land. With the space shuttle you know exactly where it is going to land. It feels more controlled. The escape mechanisms seem a little bit more realistic with the abort ones to orbit. We’re going to get into all of that with our space shuttle episode next week. With capsules it just feels more dangerous. The reality is it doesn’t seem to be that way. It feels like it should cost a lot more – reality is it really isn’t that way. Fraser: What are the components of the capsule that we’re looking at? Pamela: It varies from mission to mission. At the most simplistic level what you have is giant rocket and nosecone containing humans. As we get more and more complicated, we start adding things, a shroud that acts as basically, let’s stick the stuff that doesn’t have to go back to Earth in it area. For instance with the Gemini mission there was what looked like a bowl basically attached to the capsule that contained the life-support and some of the engines that were used to alter orbits. With the Apollo missions we carried the lunar lander, the lunar orbiting parts of the spacecraft. All of these were additional segments that were attached to the capsule but only the one capsule section came all the way back down to Earth. The Soviets have, and in fact the Chinese as well, have also carried this design with them where they have a spheroidal orbiter module that has the accommodations for the crew. It has a little tiny reentry module, that little cone-shaped piece again. There is also again this extra service module that contains extra bits; in this case, solar panels, instruments and engines. Exactly what gets added to this core cone-shaped component varies with mission to mission and has gotten more and more complex over the years. Fraser: Let’s talk about the advantages then. I guess there are really only two kinds of vehicles that have ever been used to get people into Space. There’s the capsule method and the space shuttle so next week we’re going to talk about the space shuttle. Let’s talk about the advantages of using a space capsule. Pamela: The simplest thing is it doesn’t weigh a lot for what it does. With the space shuttle, you have wings, you have avionics. You have to carry your main engines all the way up and all the way down. With the capsule you have a much more streamlined system. You don’t have all these extra bits. Not only does this save you on weight, allowing you to carry up larger servicing modules, lunar landers, and more equipment, but it also cuts down on the things that can fail. It’s this “WOW, you can do this without having a computer onboard” that allowed the Mercury craft to first take part. It wasn’t until Gemini that we started sending computer systems up into Space. Before then everything was controlled either via signals from the planet Earth or signals from the astronauts themselves. Fraser: Right, so simple is better. The shuttle I think is as many call it the most complicated machine ever built, right? Pamela: The redundancy that are required, yes the Mercury, the Gemini and the Apollo missions all had lots of triple redundant equipment. With the space shuttle now you’re building more things in multiple redundancies. With the capsules, it’s completely straightforward and a lot of things can fail before you have to actually worry about killing someone. That’s generally good in a spacecraft. Fraser: Okay, so I guess we should talk about the history of the capsules. Let’s go back to the beginning then. What is the first space capsule used? Pamela: The first space capsules were the Mercury capsules that were attached initially to the Redstone missiles. They were just intercontinental ballistic missiles that Werhner von Braun developed. Later they were also attached to the Atlas missiles. Here, basically the Soviets launched a satellite into Space and America went, “oh no, we need to think about a manned space program, what can we do fastest?” Werhner von Braun had been thinking about these problems. According to a speaker I’d heard at space camp a number of years ago, he’d actually really wanted to do manned space flight the entire time. So as he was thinking about how to build the Redstone missiles he was thinking how he could put a human on top a Redstone missile and actually do sub-orbital flight. He was pretty much ready to start putting things from paper to fabrication when the announcement came down the line that we were going to try and have the Mercury manned space program. With the Mercury seven we had the first sub-orbital flights and here it makes sense. We launched an intercontinental ballistic missile which is designed to go partway around the planet and come down. We had people basically go up almost make it to orbit and make it partway around the Earth. As we attach larger and larger rockets we were able to get all the way into orbital flight. Fraser: I believe you’re missing a whole other country here. Pamela: Well, yeah I am focusing rather on the United States this point. Fraser: Yeah, that’s okay; it’s where you’re from. You can’t help it. Pamela: [Laughter] Well I don’t see any Canadian manned capsules. Pamela: That’s true you have the whole robotic arm thing going for you. Fraser: Right but the Soviets with the Vostok with Yuri Gagarin. That was a capsule, the first human in orbit. It was the first real capsule sent into Space with a human. Pamela: Right and what’s kind of neat about the Soviet program and where I was kind of holding off is his mission was really the very first one that had a human. There’s no stepping back from that. 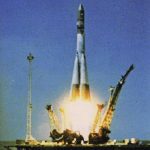 What’s even cooler about the Soviet program is they started off with the Vostok rockets and then they pretty much moved from Vostok over to the Soyuz and then they stayed there. They’ve stayed with the same technology, using the “if it ain’t broke don’t fix it” motto for decades and decades and decades. Fraser: They still launch them. Pamela: They still launch them and in fact the entire Chinese fleet, the Shenzhou spacecraft that the Chinese are now using is actually based off of the Soyuz model. It’s just substantially larger. They’ve added to it but the core components are similar. Sort of like you can buy SUVs in a variety of different sizes. This has been a very fast progression where there were basically three different Vostoks, 1K and 2K and 3KA and it was the 3KA that was used for human spaceflights. From there they started launching the Soyuz and just kept with it. It was with the Soyuz that they really perfected capsule travel. But before we do that let’s because we can, bask in the glory that is Soyuz and that’s still being used and will be used to get people back and forth from the international space station for a long time. But, the U.S. did a pretty good job with its Mercury, Gemini and Apollo missions as well. Fraser: Right so I’d love to hear about the developments and some of the improvements and some of the capabilities that went through that program. Pamela: Mercury was where we first started figuring out what we could do. What’s so amazing about the Mercury program is what we did to our poor astronauts in a certain way. How tall are you in meters Fraser? Fraser: I’m 1.83 meters; 6 feet. Pamela: Okay, so the entire Mercury space capsules were 1.7 cubic meters in size. So squish you 10 centimeters and then basically put a one meter by one meter box around you and it is a little tiny volume. Pamela: There are jokes about how Mercury capsules were more worn than ridden. I don’t know how astronauts got in and out of these spacecraft. The astronauts were not your 6 foot 4 giant military men. They actually had to be short to fit in these capsules. We’re working in an oxygen environment. When they first launched, we hadn’t thought about any of the niceties. We hadn’t thought out the fact that astronauts might need to go to the bathroom, which we discussed in our spacesuit episode. They basically had to figure out with Mercury, can people eat in Space? Can we survive going all the way up and coming all the way down and orbiting in the process? Yes. We sent up a few monkeys – Sam and Miss Sam. I love the fact that they couldn’t be more creative in the names. We sent up a few chimps, at each stage testing to make sure that each new incarnation was alright to launch. We went from first with a Redstone missile and a Mercury capsule, we launched Alan Shepard in ’61 and he made a sub-orbital flight. We then did a second sub-orbital flight with Grissom. This one was rather controversial because it kind of sank in the ocean which is rather frightening. Grissom was able to make it out and in documentation it said that the hatch unexpectedly blew off. These did have explosives built in the door and you can imagine it, yeah something went wrong. But there was always the rumor that maybe Grissom triggered it and panicked to get out and it thus sank and Grissom was rescued by helicopter. Fraser: This was the Liberty Bell and they recently discovered it and brought it up and it helped get more evidence on what happened. Pamela: One of the really cool things is everything was recovered down to the pocket knife that they had. All it really needed was to be cleaned a little bit to be back to new. Fraser: Wow. So that was two sub-orbital flights and then? Pamela: And then we launched John Glenn. He went on to be a Senator and he went on to be the oldest man in orbit riding the space shuttle many years later. He was in orbit for almost 5 hours. The previous missions had been just over 15 minutes. He was up in Space for 5 hours. There were concerns with his particular mission because the one thing that has to not fail on a capsule is the heat shield. The capsules basically come in with the base of the cone at just the right angle so that all the heat from the friction from the air heats up just the base. You have to come in at the right angle and you have to have a heat shield that has no flaws in it and completely protects the heat from penetrating and rupturing the frame or burning the astronaut. There are many different points of failure. Fraser: We’ve seen that go tragically wrong with Columbia when the heat shield fails. The heat gets in and then just destroys. Pamela: We build these things as light as we can which means that we’re using aluminum frames in a lot of cases. We’re using lightweight materials that melt easily so the heat shield is absolutely vital. There was some concern with his heat shield. He was able to make it back safely. Then from there we went on to Carpenter who did three complete orbits again and he came in off target and landed about 400 kilometers away from where he meant to but it was okay. One of the sad things is Carpenter wasn’t the one who was supposed to go up fourth. It was supposed to be Deke Slayton, but it was found out that he had an irregular heartbeat. We always talk about Mercury 7 and in fact all of the Mercury launches the astronaut got to name them and they all added the name 7 to the end of the mission. So you have Freedom 7, Liberty Bell 7, Friendship 7, Aurora 7, Sigma 7, Faith 7, and Freedom 7. Fraser: Right, because there were 7 astronauts. Pamela: But we actually only launched 6 of these missions because Slayton was pulled. I love that the camaraderie of this team was such that even though they became just 6 it’s ingrained in our minds there were 7 of them. You have to actually go back and read and realize that seventh one never launched, there were only 6. It’s good when history causes us to disremember things in a way that commemorates a team member. But there were indeed only six. From there we went on to extending to more and more orbits. With the Sigma 7 we went on to 6 orbits. From there we stayed pretty much over a day, 22 orbits, one day, 10 hours, 19 minutes. The last of the Mercury missions was where we proved it is okay to sleep in Space. It’s okay to be in Space for an entire day. From there we moved on to actually starting the Apollo program. Apollo started before we actually had Gemini in Space. Fraser: The final goal of the Apollo program was of course to land humans on the moon. We started that during the Mercury mission. In the process of NASA figuring out (and NASA didn’t even exist when Mercury started being planned, it had a different name), as we started figuring out as a nation how to put men on the moon we realized there were certain things we had to figure out first. Mercury was basically just strapping yourself to the top of a rocket and going. With Gemini, we started to debug things like we need computers in Space. We need to be able to get in and out of the spacecraft. We need to be able to dock the spacecraft with something else. Fraser: Or reconfigure the spacecraft so you’ve got it one way, you’ve got to be able to turn it around. Pamela: With the Mercury spacecraft they could get into orbit. Once they were in orbit they could kind of move the spacecraft from one orientation to another adjusting its pitch, yaw and roll. With Gemini they actually had additional engines that allowed them to change the orbit of the spacecraft itself allowing docking maneuvers to take place. Gemini was primarily dedicated to figuring out how do we accomplish all of these different things? Once there were one by one each accomplished then we started basically killing off planned launched. There were several planned Gemini launches that never took place. It was a very short break between the two programs. We had the last Mercury launch in 1963 and Gemini was already starting to put new people in Space in 1965 just two years later. The very first Gemini flight did 3 entire orbits. The second Gemini flight was when we did the first spacewalk with White going out and spending 22 minutes outside of the capsule. The biggest goal with going to the moon beyond just the technological achievements of can we dock, can we change orbits, can we go outside – that’s actually technology problems. We also had to figure out can we live in Space for prolonged periods of time? It was with the third Gemini mission that we made a huge jump. We went from just one day max with the Mercury program to four days with the second Gemini to then we went out to 7 days with the third Gemini mission. We stretched it all the way out to almost 14 days – 3 days, 14 hours with the fourth Gemini mission. Fraser: That must have been so difficult to be in – I mean I guess the space capsule was a little larger but even so imagine spending 14 days essentially side-by-side with another person in some cases, out in Space where everything is so much harder to do. Pamela: There are a lot of museums that have either original Gemini or mock-ups of the Gemini capsules or Gemini training capsules. I encourage any of you that go to a science museum and have an opportunity to see one of these things to put yourself in the seat and then imagine being in that space for 2 weeks. A lot of us have trouble sharing hotel rooms with business colleagues. A lot of us live in large houses and like to just sprawl out in all of our space and large bathrooms that are separated by sinks from bedrooms. In these little tiny capsules, everything you did was completely in the open to the other two people. There was no privacy. There was no escaping any biological function, any argument, and miscommunication. Conversations between you and your spouse were between you and the world basically. Those 2 weeks must have been a really long 2 weeks. It says a lot about the mental stability of the astronauts that they chose for these missions that all these years later we still aren’t hearing well that crew completely melted down. These are people that have gone on to be national heroes. Fraser: What was sort of the end of the Gemini program? Pamela: Gemini went on and from their big 14 day mission after that they pretty much focused on figuring out docking problems. They had problems not so much with the Gemini as what they were trying to dock with. There were a series of short missions after that no more than nearly 4 days after that. They did a series of shorter missions perfecting docking. Gemini 12 was the final Gemini flight. It flew in 1966 so we had basically this mission the entire Gemini program went from March 1965 to November of 1966. It was a very short period of time that accomplished a ton of technological goals. From there we jumped straight to the Apollo missions with a slightly larger capsule and a whole lot of additional things that got carried up in Apollo making it much more humane on the astronauts to go up into Space. Fraser: You know what? We’ve run out of time. Why don’t we next week talk about Apollo and the Russians and the Chinese and the future? Pamela: That sounds like a plan. I think any discussion of the Gemini program should include the close call involving Niel Armstrong and the docking incident with the Agena module. We almost lost 2 men in space. If it wasn’t for Neil’s cool head and quick thinking, the mission could have significantly impacted the Lunar Program. I believe it was this incident (and another training incident) that convinced NASA to make Neil the first man on the moon. As it turns out, a very good decision. He made a landing on the moon under conditions that would un-nerve almost everone. He is a true Hero and I think the magnitude of his personal fortitude and accomplishments are not fully appreciated. I have to say I was very disappointed with this episode. It was 99% from an American perspective – in fact most of the references to missions were from a “we” point of view. When there was an attempt to address that balance, the response was a curt “well I don’t see any Canadian manned capsules.” I would have loved to hear about the Vostok mission, Gagarin, and subsequent Russian manned space flight as well. I would hope that Astronomy Cast would try to bring a balanced perspective to its shows, and avoid political bias.